The fast-acting, soothing and long-lasting cream that provides the relief you are looking for. HOW CAN Rub On Relief ® HELP? No matter what your “grin-and-bear-it” physical discomfort is… now you can feel relief in minutes. Just rub it in… feel a pleasant tingle of the ingredients penetrating your skin and then… BAM! Soothing relief. Rub On Relief® is the ONLY soothing topical cream to ATTACK and reduce the most common types of discomfort your body throws at you. Contains only ingredients with a safe track record and no chemicals, preservatives or toxic junk. NO stomach upset. NO dangerous toxins. It is so safe you can use it on your children or grandchildren age 10 and up. This naturally occurring fatty acid is believed to lubricate joints, soften muscles, and increase flexibility. Peppermint leaf oil is an ancient herbal medicine used in Europe and the Middle East to rapidly provide cool relief to irritated muscles. Peppermint leaf oil actually tricks the body with its cooling touch. It sends a cooling pleasing sensation to your brain that thwarts the stinging heat of inflammation. Camphor provides a pleasant warming sensation. It’s the perfect contrast to the cool relief provided by the peppermint leaf oil. The warm/cool sensation of camphor and peppermint leaf oil will feel amazing on any muscle discomfort. Plumeria Oil is said to be derived from the flowers of the “Tree of Life.” It has aromatherapeutic properties and can help calm your mind, body and soul. 2 REF1: Osteoarthritis and Cartilage (2008) 16, 1277e1288 REF2: Nutrients. 2017 Mar; 9(3): 290. 7 REF: Foods. 2017 Oct; 6(10): 92. 8 REF: Osteoarthritis Cartilage. 2014 Jan; 22(1): 128–132. 9 Boshtam M, Moshtaghian J, Naderi G, Asgary S, Nayeri H. Antioxidant effects of Citrus aurantifolia (Christm) juice and peel extract on LDL oxidation. Journal of Research in Medical Sciences : The Official Journal of Isfahan University of Medical Sciences. 2011;16(7):951-955. 10 Sun J. D-Limonene: safety and clinical applications. Altern Med Rev. 2007 Sep;12(3):259-64. Review. PubMed PMID: 18072821. 11 REF: Pharmacogn Rev. 2013 Jul-Dec; 7(14): 179–187. We all know exercise is good for us, but ouch it can hurt. You could ache for days. So here’s a trick to stop pain before it starts… dab a squirt of Rub On Relief on right after your workout… before the painful flare-ups. That way you’ll “short-circuit” the pain at the source. “I have arthritic hips, legs, back and ankles. I have used a variety of mail order products. None of them worked. I tried Rub On Relief and very quickly the pain went away. I was amazed I found something that worked for me. 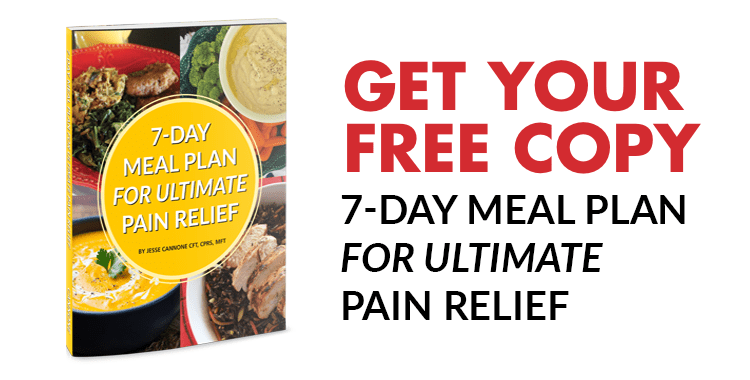 I apply the cream twice a day—in the morning and right before bed—it lets me go through the day easily.”Click here to learn more about the product that was used to get lasting relief. "2 days ago I seriously sprained my big toe, I thought I broke it. It was very painful and terribly bruised, I rubbed the relief cream on it and got some relief, last night I rubbed more and slept well. This morning most all of the bruising is gone and the pain is nearly all gone. I wished I had taken a before pic and after to show. Thank you so much for this wonderful product"
"I have arthritis in my hands, fibromyalgia, and recently had rotator cuff surgery. I stopped using prescription Voltaren gel and began using Rub on Relief instead, I can't tell any difference in the relief and the price is much less. I bought the 9 tubes. I'm good for a while and the smell isn't as strong. Thanks! -Nancy Lail, Nebo NC"
Rub on Relief (Herbal formula) is free of Eggs, Fish, Crustacean Shellfish, Milk, Soybeans, Tree Nuts, Peanuts or Wheat. 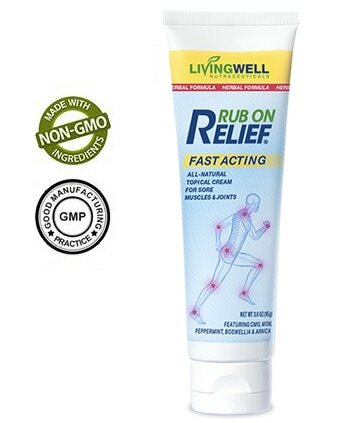 Rub on Relief (Herbal formula) is Non-GMO. Living Well Nutraceuticals® is truly excited to partner with The Healthy Back Institute in launching the All-New Rub on Relief® Herbal Formula. This will be our most advanced/comprehensive formula to date, in part because we are using a blend of whole plant oils and some powerful plant extracts all of which have beneficial components that our bodies use on a daily basis. This All-New Herbal formula retains three of the most essential ingredient including (Cetyl Myristoleate, Magnesium Sulfate and MSM). These three ingredients alone have a long and strong track record when used topically for sore muscles and ache joints, but we did not stop there... We have chosen to fuse Cinnamomum Camphor and Peppermint Leaf Oil as there are some very powerful naturally occurring compounds in each of these components, including menthol that feels cool and Camphor that feel warm, but what is even more compelling are the additional compounds found in both of these oils, that you may never have heard of but are the secret sauce to this formula. We can call these next four extracts “The four princes of plant-based relief” they are Arnica Montana flower extract, White Willow (Salix Alba) Extract, Turmeric (Curcuma longa) extract and Boswellia Serrata extract, either one of these alone will help support your muscles and joints but together, they are blueprint for a resilient body. No, topical cream should be without a strong citrus blend so we added Lemon (Citrus limon) Oil and Lime (Citrus Aurantifolia) Oil, for their impressive health benefits including antiseptic, antiviral, astringent, bactericidal, disinfectant, febrifuge and not to mention they provide a very faint yet pleasant all-natural fragrance. I bet you have never heard of Calendula (Calendula) Officinalis Flower Extract, we added it because it contains a bioactive compound called Sesquiterpenoids and these Sesquiterpenoids have been found to be antimicrobial and have anti-inflammatory properties. Please note, the base formula for Rub on Relief has not changed, with that said, we invite you to feel the difference it can make for your sore muscles and achy joints, without a prescription or harsh chemicals or obnoxious odors, just powerful natural ingredients to support you in your active and busy life. Athletes actively involve in Golf, Swimming, Tennis, Running, Triathletes, Mixed Martial Arts and even Pickle Ball for post-workout recovery and a training advantage... Health Practitioners including Doctors, Chiropractors, Massage Therapist and Naturopathic doctors. People actively involved in Hobbies like Gardening, Weekend Warriors and those looking for improved Pliability of their muscles and joints... The age range of our users is between 10 and senior citizen. Those that DO NOT want to take oral pain medications. Apply a dime size portion to the affected area up to 4 times a day as needed. Massage into affected area until lotion is fully absorbed into the skin. Children under 10 yrs. of age, It is suggested that you consult a physician before use and applied only by an adult. Please keep out of reach of children at all times. Everybody’s different but on average you can expect hours of relief from each application. What long-time users have told us is that the more consistently you use the product, the more effective it is over time. Remember that you can apply more as needed throughout the day. Please understand that while Rub on Relief Herbal formula is a natural product, it powerful and we have to suggest that you consult your physician before use as only they know you're complete medical history and only they can give you a complete and appropriate answer based on their medical treatment plan they have set for you. You could feel both: We have chosen to fuse Cinnamomum Camphor and Peppermint Leaf Oil as there are some very powerful naturally occurring compounds in each of these components, including menthol that feels cool and Camphor that feel warm, please understand that the effectiveness is not dependant on the cooling sensation you will feel. We only suggest that you apply the lotion to targeted body parts, (as needed) do not attempt to cover large parts of the body with a single continuous application. That depends entirely on how you use it. The Tube contains 3 oz and should last you many many applications. Yes. Some people have used the formula Rub on Relief for years. Women who are Pregnant or lactating check with their Physician. Children under the age of 10, parents should consult the child's Physician. Individual with open wounds, sensitive or irritated skin. Do not use as a sexual Lubricant. 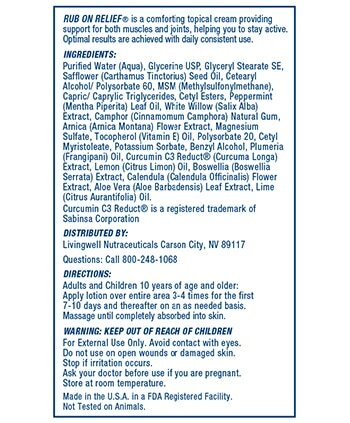 Be sure to read the complete label before use, ensuring that you are not allergic to any of the ingredients listed before starting Rub on Relief Herbal formula. Anyone taking any medications should check with their Physician before starting Rub on Relief Herbal formula. We can not suggest or support the use of Rub on Relief past the expiration date on the tube. If you choose to take the product past the expiration date you do so at your own risk. The shelf life for a tub of Rub on Relief Herbal formula is 2 years. The expiration date is heat stamped into the top of the tub, (showing on the back side). 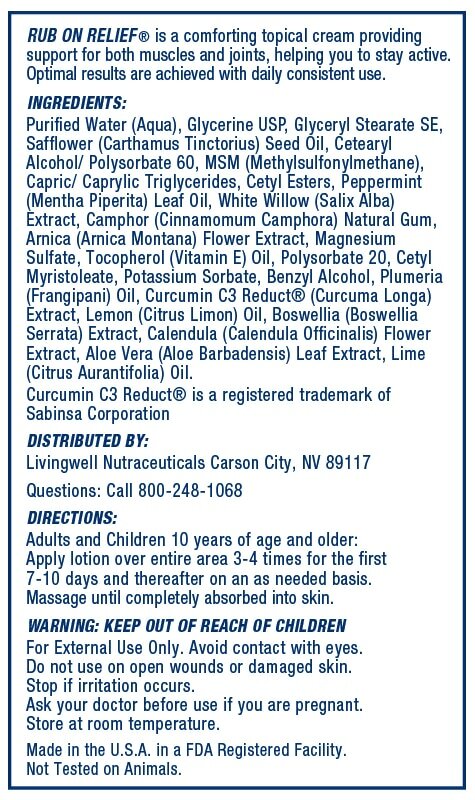 We do not suggest or support the use of Rub on Relief Herbal formula past the stamped expiration date. No, Rub on Relief is not a 100% certified vegan product. The Cetyl Myristoleate (CMO) is animal sourced. We guarantee you’ll love Rub on Relief or we’ll refund your money. 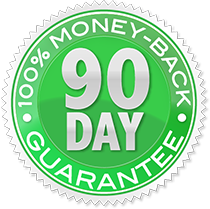 If you’re not happy for any reason, simply return Rub on Relief within 90 days of your purchase date for a full refund, less shipping. No questions asked.